Using Neo-Aristotelian Rhetorical Theory as a backdrop for exploring what it means to be a college graduate 2.0, we will review the current literature on graduating in a web 2.0 world, examine why developing a digital presence is critical for one’s career, pursue strategies for developing a digital presence, and explore the personal and professional morphing of digital presence and its subsequent implications. 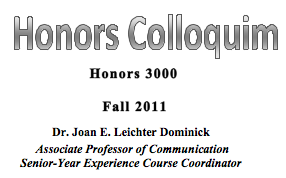 Will satisfy one Honors Colloquium requirement. Assignment One: Using Neo-Aristotelian Rhetorical Theory, develop your strategic plan and storyboard for sharing your story. Assignment Two: Using Neo-Aristotelian Rhetorical Theory, produce your strategic plan and portfolio for sharing your story. All course work is due on assigned date. Failure to turn in course work on the scheduled date results in late work worth half credit. Exceptions to this will be handled on a case-by-case basis. Every KSU student is responsible for upholding the provisions of the Student Code of Conduct, as published in the Undergraduate and Graduate Catalogs. Section II of the Student Code of Conduct addresses the University’s policy on academic honesty, including provisions regarding plagiarism and cheating, unauthorized access to University materials, misrepresentation/falsification of University records or academic work, malicious removal, retention or destruction of library materials, malicious/intentional misused computer facilities and/or services, and misuse of student identification cards. Incidents of alleged academic misconduct will be handled through the established procedures of the University Judiciary Program, which includes either an “informal” resolution by a faculty member, resulting in a grade adjustment, or a formal hearing procedure, which may subject a student to the Code of Conduct’s minimum one semester suspension requirement.